8,000,000 B.C. to 8,500 B.C. Until very recently, humans explained the creation of the universe, the Earth, and themselves through stories called creation myths. A god sees a void in the world and fills it with land, water, important plants, and people. Explains how things began, as well as the divine plan (Why did god create us and what does he plan for us?). This promotes cultural unity – people feel closer together when they understand why they are here. Most familiar to western society is the Judeo-Christian story of Genesis. In it, God created the Earth in 6 days and rested on the 7th day. He created the first man, Adam, out of clay, and the first woman, Eve, from the rib of Adam. He allowed them to live in paradise – the Garden of Eden. Concept that one species of plant or animal can (and did) change into another over a very, very, very long period of time. He argued human beings evolved from ape-like ancestors. Idea that plants and animals with traits that aid in their survival will live long enough to pass these traits to their offspring (through genes), who will, in turn, survive. 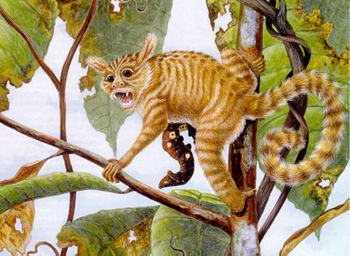 In contrast, plants and animals with bad survival traits will die out and become extinct. Sapere Aude! Pretend it is between eight and six million years ago in Ethiopia, Africa. You are an ape living among many apes in what was once lush forests. The problem is that the earth has become very cold, and your area of Africa, while not cold, is drying out, causing the forests to die. This means your habitat is disappearing. Many apes are dying. Citing (using) the lecture’s description of Darwin’s Survival of the Fittest, explain in detail how your small troop might survive. Back up your ideas with clear, concise logic. 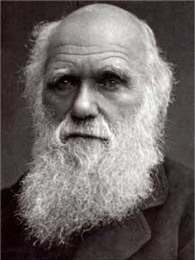 Darwin published his book, The Descent of Man, in 1871. In it, Darwin claimed that humans had evolved from apes, and this evolution most likely started in Africa. The Descent of Man was immediately controversial. By 1900, virtually all scientists accepted evolution. Humans were seen simply as animals, though very special ones, shaped by nature over a long period of time. However, there was disagreement as to Africa being the homeland of all human beings. In fact, many tried to make the case for Asia as the original homeland. Of course, many regular people without scientific backgrounds were unwilling to accept Darwin’s theories at all. Although most scientists accepted this, many people did not. In fact, there was a time when teaching evolution was illegal in some places in the United States. 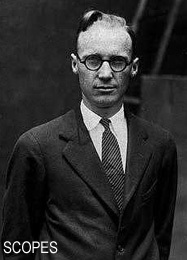 The Scopes-Monkey trial (in the early 20th century) centered on the trial of Mr. Scopes, a teacher who had taught his class the theory of evolution. He was found guilty of the charges, but was not severely punished. It’s important to stress that no matter what you believe, one explanation is not more correct than another. The individual must decide what he/she will believe with the guidance of his/her family. The “missing link” is supposed to be the human-like ape from which modern humans have evolved. 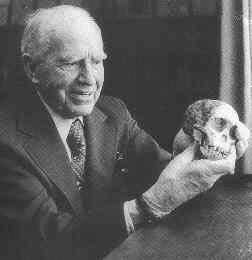 Scientists are still looking, but in 1924, Raymond Dart, a biologist, discovered the remains of a human-like ape in the sub-Saharan desert of Africa. This creature lived over 3 million years ago. Dart named this creature Australopithecus africanus. B. It is useful to envision evolution as a tree, branching out in several directions. Many branches live a long time, but eventually die out. All the branches of the human tree of evolution eventually died out, except one: Our branch. So, what is the story scientists tell about human evolution? A. Around 70 million years ago, the first primates appeared. This was just before the extinction of the dinosaurs. Around 25 million years ago, monkey-like primates appeared, and primates resembling apes appeared 18 million years ago. Human beings are members of the primate order. B. Around 8 to 6 million years ago, anthropoid-like primates appeared. An anthropoid is an ape with human-like physical features, i.e. walking upright. C. Among these anthropoids appeared the hominids, of which modern humans are included. This doesn’t mean hominids were human, but shared features similar to modern humans. Whether an anthropoid is considered to be a hominid or not, depends on its anatomy, particularly its dental anatomy. 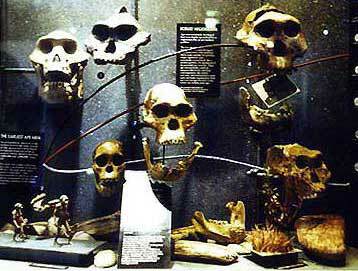 Around 2.4 million years ago, the Homo line probably evolved from the Australopithecines–the first know example being Homo habilis. Human-like body with an ape-like face. Lived in the trees, but could walk on land. Late Australopithecines may have used stone tools to break bone. Bone marrow and brain matter may have been a food source. Used more sophisticated tools. They had the brain capacity to allow for spoken language, but no one knows for sure if Homo erectus communicated through speech or in other ways. Around 700,000 years ago, a new contender in the Homo genus emerged. It, too, would eventually leave Africa, but unlike Homo erectus, it would go to Europe. 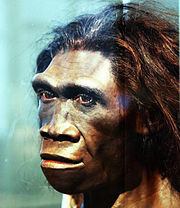 This new contender was Homo heidelbergensis. Around 300,000 years ago, Homo neanderthalensis, or the Neanderthals, began to evolve from Homo heidelbergensis, and by 120,000 years ago the Neanderthals were their own distinct genus and species. Their bodies evolved to adapt to the Ice Age. Neanderthals lived in Europe, Africa, and parts of Asia. Prehistoric humans may have forced the neanderthals to extinction either through over competition, killing, or both. 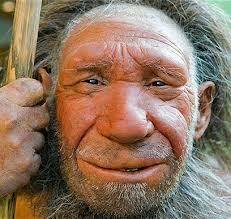 Neanderthals became extinct around 30,000 B.C. 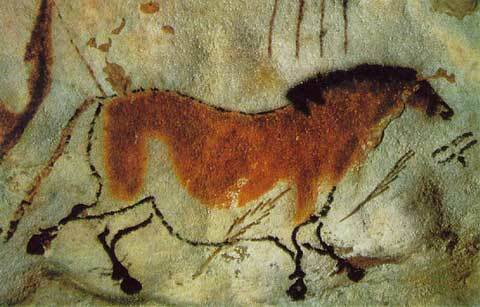 Modern and prehistoric humans possess abstract thinking – prehistoric humans could express themselves through art, i.e. cave paintings or statuettes. Modern humans first evolved in Africa. They first left Africa around 125,000 years ago and lived in the Near East. This effort eventually failed. The earth was undergoing drastic climate change, and humans were nearly wiped out. Some scientists estimate that only 5,000 humans may have survived in Africa at the worst of this difficult time. Around 60,000 years ago, modern humans were ready for another try. They crossed the Red Sea.The Red Sea’s sea levels were much lower than they are today. They rest is history. Over several thousands of years, modern humans successfully populated Africa, Asia, Europe, and eventually…the Americas. It is theorized that all human beings today are related to the humans who left Africa 60,000 years ago. For about 190,000 years humans were hunter-gatherers. Hunter-gatherers lived in small clans (family groups), and moved with the migrating animals they hunted. They built simple hut-like dwellings that could be disassembled and moved quickly. Often caves were converted to provide temporary shelter. They had no permanent place where they lived. Men hunted large game and women gathered fruits and nuts. All “ages” in history refer to the predominant technology used. 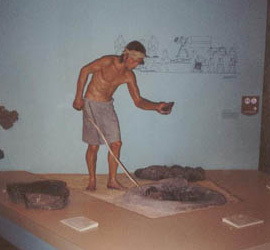 In the Paleolithic and Neolithic Ages, stone tools were used. Paleolithic tools were more primitive than Neolithic tools. 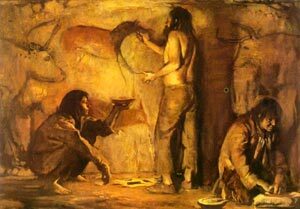 Paleolithic Age lasted from roughly 400,000 to 10,000 B.C. Neolithic Age lasted roughly from 10,000 to 5,000 B.C. – give or take a few hundred years. At the end of the Neolithic Age people began to form urban societies. These urban societies centered on small towns and villages populated originally by clans. Urban society only became possible out of the development of agriculture. A. At certain places around the world, usually around rivers or lakes, people made the cultural jump from hunting and gathering to agriculture. Agriculture is the systematic, organized growing of food. Toward the end of the Neolithic Age, societies began growing their own food. Soon, so much food was produced that these towns and villages found they had a surplus of food. No longer did everyone have to hunt or grow their own food, because there was extra food to be had that was produced by others (farmers). This led to the specialization of labor. This means that some people started specializing in making products other than growing food. Artisans specialized in making pottery, forming metals, and making things other people needed. Farmers and artisans would exchange what they needed – Farmers needed tools and artisans needed food. This led to an economy and eventually money (although this would take awhile). Trade developed out these growing economies. Trade is the exchange of goods between people for other goods or for money. Trade is necessary for civilizations and empires. A surplus of food also meant bigger populations. With bigger populations, towns and villages grew into city-states. City-states are cities not controlled by another government. City-states became complex, and needed people to run the economy and protect it from invaders. A ruling class (kings) developed – originally from a strong clansman, who proved to be a good fighter and leader. Since farmers (and everyone else) depended on agriculture, city-states needed religious figures to negotiate with the gods to ensure a good harvest. A religious class (priests) developed out of this. Often the ruler of a city-state was also its religious head. Later, this would become so specialized that these priest-kings were seen as gods themselves, i.e. the pharaohs of Egypt. A civilization is a large, urban society with complex institutions. In other words, to have a civilization a people must live in a society with agriculture and a surplus of food, specialization of labor, a large economy, trade, a large government, and religious centers with a priestly class. A civilization must have these parts to be a civilization. The first civilization began in 3,500 B.C. in Sumer, Mesopotamia, near the Euphrates River in modern day Iraq. Sapere Aude! Critique (evaluate) the following statement: Without agriculture, civilization would be impossible. Back up your opinion with detailed, clear logic.